I’ve got another Soulstice polish to show you today; this one is an older shade that I purchased online from Nail Polish Canada. Monterey is a medium dusty blue creme. In fact, on applying one coat, it looks like the base is sheer and milky, which gives the polish its soft, dusty look. I had a hard time capturing the true colour of this shade; in real life it seems a bit softer than some of these photos suggest. Monterey covers pretty well in two coats, although the formula is slightly thin so if your nails have ridges like mine, it’s better at three coats, which is what I used for these photos. I didn’t have any base coat under this swatch, so a ridge filler probably would have helped too. 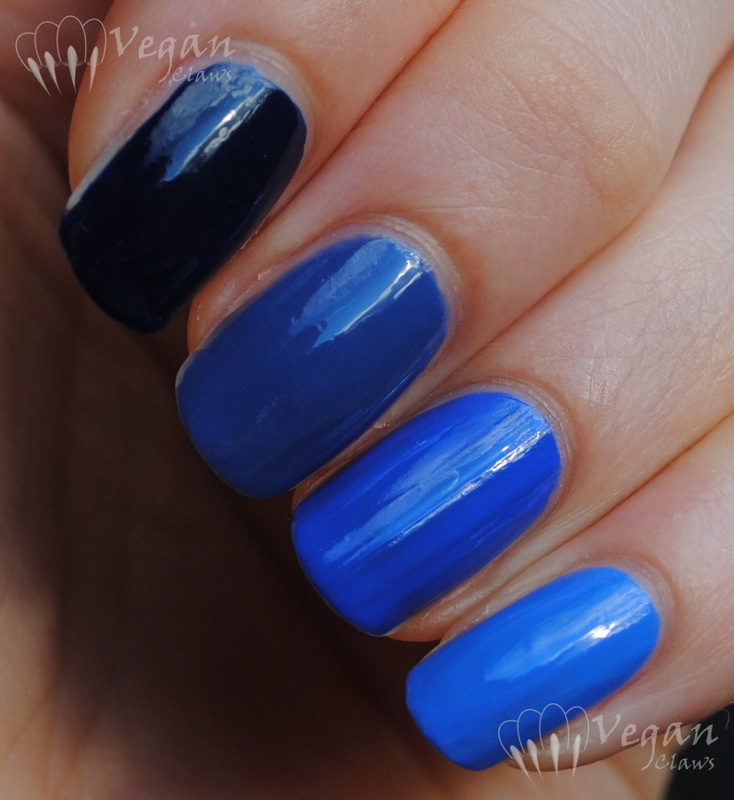 I have a comparison to some other blue polishes that are actually not very similar to Monterey at all! From left to right, Cult Nails Time Traveler, Monterey, Nails Inc Baker Street, and Sally Girl Epic which is like a lighter version of Baker Street. Monterey actually looks truer to colour in this photo. After doing that comparison, I realized that I actually *did* have a polish that was much closer to Monterey than the others, Nubar Boyfriend Jeans. This photo makes these polishes look darker than they are, but it shows the two relative to each other. Closer, but far from being a dupe; Boyfriend Jeans has a hint of teal in it in comparison. I love Monterey; I love the milkiness and the way it builds up and the fact that it’s super glossy (no top coat in these photos). And as the comparisons show, it’s also a totally unique shade of blue in my polish stash! Liking your comparison here to Nubar “Jeans.” I never would have got that from the other photos that look so much lighter. Not sure I am still seeing the teal in this next to Jeans even in the really light coverage areas of swatch stixs. What I do see is less black in Monterey. First photo I had this one in the ball park of ChG First Mate. I don’t have access to this brand but my mail order – darn it. I love a good cream formula! Well, more just in comparison, like it has one drop of teal in it compared to Monterey… or maybe I should say Monterey has a drop of purple in comparison to Boyfriend Jeans! Something like that, anyway! 🙂 I don’t have First Mate, but judging by photos, it’s similar in tone to Monterey, but a bit darker and bolder!